STUNNING, Four Bed Family Home with Bathrooms on both Levels, Immaculate decor Throughout which must be seen, 16ft Lounge, Fantastic Family Room to the Rear with Vaulted Lantern Ceiling, 22ft Modern Kitchen/Breakfast Room and Utility. Versatile Accommodation. Natural Oak wooden security entrance door, neutral painted ceiling and walls, tiled effect vinyl flooring, ceiling light point. White UPVC door with decorative double glazed inserts, neutral painted ceiling, neutral painted walls, wood laminate flooring, radiator, stairs to first floor. 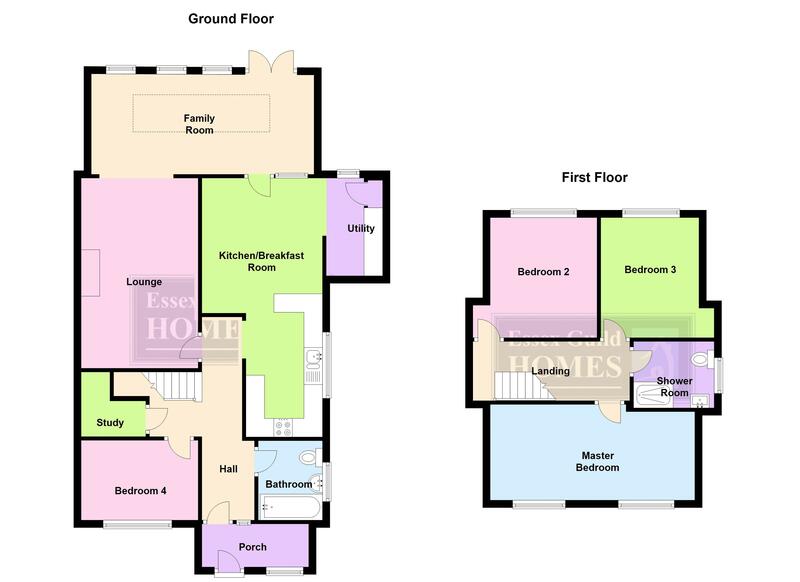 Neutral painted and coved ceiling, plastered walls in neutral colours, "Feature cast iron fireplace with natural wood surround and polished granite hearth", wall light points, television aerial point, various power points, radiator, wood laminate flooring, open plan to family room. High vaulted large lantern ceiling, double glazed windows and doors to rear garden, smooth plastered ceiling with inset lights, smooth plastered walls all painted in neutral colours, radiator, various power points, wood laminate flooring. White double glazed window to side, plastered and coved ceiling, inset lights. Recently fitted kitchen with high gloss units at both base and eye level, gloss marble effect worktops, four ring ceramic hob with decorative tile splash back, built in double oven, one and a half bowl granite sink with chrome mixer tap, integrated dishwasher, breakfast bar with seating for several people, space for American fridge freezer, television point, radiator, cupboard housing combi boiler, glazed doors to family room. Smooth plastered ceiling and walls, inset lights, door to walk-in cupboard, high gloss wall units with natural wood effect trim, roll top work surface with space for three domestic appliances below, wood laminate flooring, various power points, radiator, double glazed window to rear. Plastered ceiling and walls, space for office furniture, telephone point, various power points, wood laminate flooring. Plastered and coved ceiling, ceiling light point, neutral coloured walls, double glazed window to front, wood laminate flooring, radiator, various power points. Fitted in 2017. Smooth plastered ceiling with inset lights, double glazed window to side, mostly tiled walls in neutral coloured ceramics, modern bathroom suite with low-level w.c., feature hand basin with cupboard below and chrome mixer tap, panel bath with mixer tap and separate rainfall shower with additional flexible hose, glazed courtesy panel, heated chrome towel radiator, wood laminate flooring. Plastered ceiling and walls, part-papered walls, neutral-coloured carpet, door to walk-in storage cupboard, loft access. Good Size Master with white double glazed windows, plastered ceiling, ceiling light points, papered walls, radiator, various power points. Double glazed window, plastered ceiling, neutral coloured walls, radiator, various power points, wood laminate flooring. Fitted in 2017. Double glazed window to side, plastered ceiling, inset lighting, fully-tiled walls in neutral-coloured ceramics, modern suite comprises low-level w.c., feature hand basin with natural wood cupboards and drawers below, chrome mixer tap, tiled shower cubicle with glazed doors and side panel, stainless steel trim to rainfall shower with flexible hose and multi-jet function. Wood effect vinyl flooring. Commences paved sandstone patio which extends to side and rear, artificial grass lawn, well-matured beds with shrubs and bushes, feature pergola with "hot tub" which will remain, panel fencing. Playhouse to remain. The side of property is laid with shingle with outside tap and shed (to remain) with gate providing access from rear garden to front of property. Mostly laid with small stone pebbles allowing parking for three to four vehicles, various shrubs, bushes and trees, outside light, panel fencing to side, gate provides access to rear garden.